UltraSoC participated in the latest (8th) RISC-V Workshop in Barcelona, 7th to 10th May 2018. 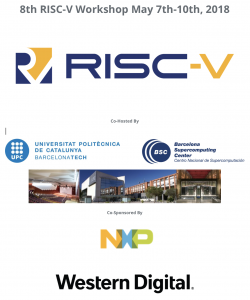 This Workshop was co-hosted by Barcelona Supercomputing Center (BSC) and Universitat Politècnica de Catalunya (UPC), and sponsored by NXP and Western Digital, and showcased the significant progress the Foundation and its members have made in establishing the ecosystem for the open source processor architecture, as well as agreeing the continued evolution of its instruction set. UltraSoC continues to plays a leading role in the ecosystem for RISC-V, where it has become the industry standard for trace and debug. Please click here to see our blog post ‘RISC-V Workshop: security, scalability and Super Mario’. 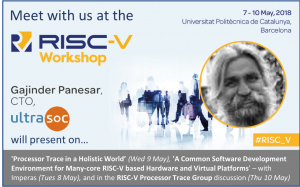 You can also find the presentation slides from the 8th RISC-V Workshop by clicking here.